CVP had just completed a management buyout and were planning how to take the company forward. We had an excellent foundation, a great team with the right skillsets and the fundamental core values of understanding the needs of our customer and ensuring they are met. We knew we could build on these roots, add more engineers and offer additional services – but we also felt there was a definite need in the industry for a better way than two or three trade shows a year to help people understand how new technology and products could help them achieve their creative goals. Firstly we set up the ARRI Creative Space in Charlotte Street, London. The idea was to let customers have the product experience that they could only get at ARRI in Munich; but being run by CVP rather than ARRI, it’s independent as well as being a unique facility to the UK. Customers told us they really liked that it wasn’t a sales environment - they could just come in for a chat and tell us what they were trying to achieve, or even just have a play with the cameras with no pressure. This led us to the idea of creating another facility with a wider choice of equipment but with a similar atmosphere and purpose. At that time we had a facility in Gresse Street but it didn’t have the flexibility of space that we wanted, so we started looking for a new location. 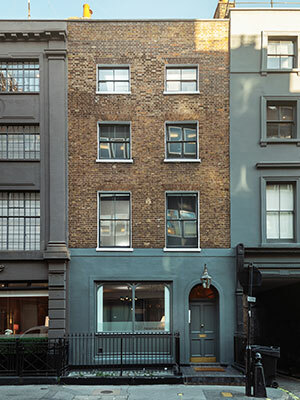 In November 2018 CVP opened a unique showroom called the Creative Experience, in Newman Street, London. It is full of production equipment across its five floors, from leading manufacturers including Sony, Canon, Zeiss, Angenieux, Blackmagic, ARRI and RED. The concept behind the Newman Street facility is to enable visitors to walk in with a creative idea and walk out with a complete technical solution that can fulfill that idea. Visitors can discuss their projects with one of our technical staff, all of whom have solid creative and technical knowledge, know the products inside and out, want to find the right solution for each individual production need – and, crucially, aren’t working on sales commission. If someone comes to us for a product, they will ensure it works as a package for their project; they will advise what options will best fit the user’s needs, inform them of any issues that may arise from incompatible choices and offer alternatives. Of course, we still like to make sales – we all have mortgages! However, our philosophy is that repeat business is better than one-off kit sales; if someone feels we have listened to them, understood their needs, given good and impartial advice – even disagreed with them - and cared about their end results, we can build a trusting long-term relationship. The equipment available at Newman Street is a veritable playground for creatives, ranging from the latest cameras and lenses to tripods and gimbals to switchers and editing solutions. Like a trade show, visitors can see the products close-up and play with them; but unlike a trade show, they can go to the Camera Testing Area to try out an ARRI camera with an Angenieux lens on a OConnor tripod – or any custom solution they want to build with the showroom’s kit - to see how different products will work together to meet the technical criteria as well as achieving their creative vision. There is also a Motion Room filled with the main gimbals to test, and a Monitor Zone with the best 5” and 7” monitors the industry currently offers, all displayed next to each other and synced via a video router. Visitors can plug in any camera or video feed, and the same image will be displayed across all 20x monitors at the same time. This is a unique way to test a variety of monitors to really see which best fits the customer’s needs. While the equipment is important, we also wanted to create a space that could be used for training, networking, presentations and even production meetings and small screenings. We are running a variety of training sessions, some product-based and some skills-based, where people can come to learn something new and get better at their craft. While we might cover the features or functions of a product, we will also look at how that product can best benefit users in a true working environment – the benefits, pitfalls and workarounds where the overall product is the right one but there’s an element where it’s not so good… the key thing is that we’re agnostic so we can point these things out. The goal is that every time a customer makes a decision, it’s informed and there are no surprises. Thanks to our relationships with the main manufacturers, we are also hosting brand-based training from Canon, Sony, RED, ARRI and others. Networking is a key element of our industry, and we have already started hosting events relating to specific industry bodies such as the BSC and ACO, or vertical markets like education. Customers can also book space for board meetings or production meetings, in a quiet and discreet environment that allows discussion. Newman Street has only been open for a couple of months, but the reaction has been overwhelmingly positive; so much so that we decided to replicate it – in a condensed way – for the BSC Show in February. Anyone can turn up to a trade show and fill a stand full of shiny equipment. Our aim at the BSC Show is to give visitors a taster of the customer-focused experiences they can enjoy at Newman Street and Charlotte Street; we’ll have a range of camera equipment and accessories that visitors can mix and match with advice from our technical team. We’ll also be demonstrating our outstanding pre- and post-sale expertise and service, including a demo of our online ‘track and trace’ repair service that enables customers to follow their equipment throughout its repair. Plus we’ll have a bar and lounge area for some traditional CVP hospitality. So – last year was pretty busy for us, but I think we can safely say that 2019 has started at an even faster pace and shows no sign of slowing down.